A few weeks ago my friend Jennifer told me about Pita Pizzas. Now, if you have been reading here long, you know I love to make Homemade Pizza Dough. So, when she shared the concept of a Pita Pizza, I thought there was no way it could even come close to my Homemade From-Scratch Pizza. Well, I was wrong…. 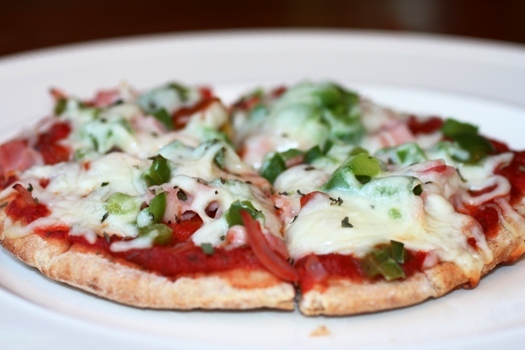 Pita Pizzas are not only quick and easy, but they are so amazingly good. I love how the pita bread turns out crunchy and chewy. When I get the pitas I look for the biggest ones I can find, which lately have been at Trader Joe’s. 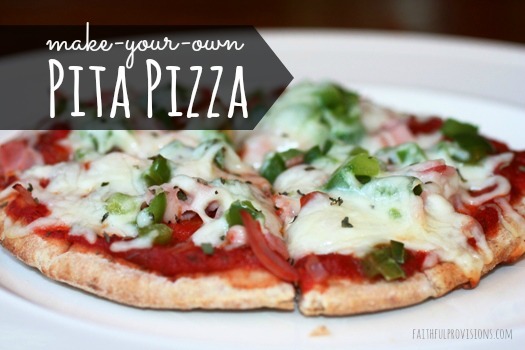 These make for personal sized, make-your-own pizzas that my whole family loves. Everyone in my family likes something different on their pizza, so it is always a challenge trying to figure out which one to make. My husband loves ham, mushroom, and pineapple, and I love anything that is “gourmet-ish” like goat cheese, red peppers, and caramelized onions or has Frank’s Hot Sauce on it. And the kids, of course, usually prefer cheese or pepperoni. They like to keep it simple. Depending on what we are topping the pitas with, I use my Quick and Easy Homemade Pizza Sauce, which is usually either on-hand in my refrigerator or freezer. If you need some topping ideas, here are a few of my full-sized recipe versions to get your creative juices flowing. But, I recommend just putting your favorites on in abundance! 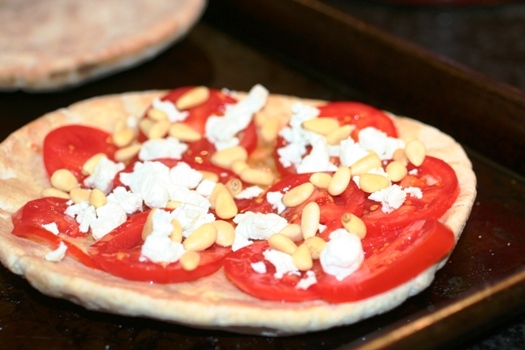 Place pita bread on a baking sheet. Cover with pizza sauce or olive oil and top with your favorite toppings. Cook for 4-7 minutes or until cheese melts and crust is slightly crispy on edges. We typically use the Touyfan pitas from Publix. They’re about $1.20 for 6 of them. I also love to sprinkle fresh Parmesan cheese on top (or Sargento shredded Parmesan) – it takes it over the top! 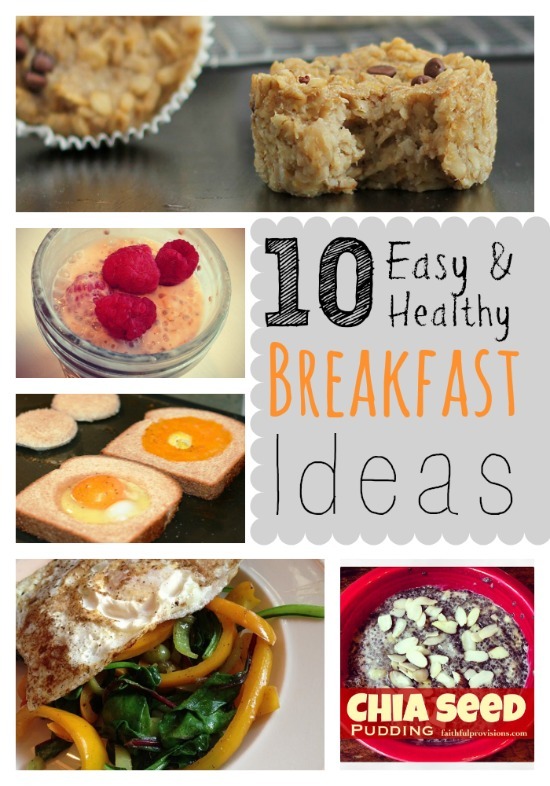 We love that each person can make their own & get as creative as they want! Been making Pita Pizzas for years! My aunt introduced me to them over 20 tears ago. I slice them open and make two pizzas out of each pita. Then I top with tomato sauce and italian seasoning. So simple yet sp delish. They are a big hit!